The Greensboro, NC, Parade of Homes happens twice a year, once in the Spring and once in the Fall. At each event, future homeowners will get a glimpse of the latest homes for sale in Greensboro NC and surrounding communities and have the chance to buy with interest rates at a historic low. Around each April and October, please join the Greensboro Builders Association in viewing around 50 of the newest and best homes in Greensboro. Admission to the parade is absolutely free, and everyone is welcome. All of the homes within the parade are worth a look — even visitors who aren’t in the market for a new home can enjoy taking a look at the latest home features. Homebuilders and remodelers, as well as suppliers and contractors, will be available and eager to answer questions regarding buying or building a new home. Viewers not ready to buy a new home may find ideas for new additions or remodeling their existing homes, as well as have the opportunity to become acquainted with the work of our best local homebuilders. On the tour, viewers will find these homes feature energy efficient installations, beautiful master suites, enviable modern and stylish kitchens, great landscaping, and much more. The Greensboro Builders Association offers some of the most exquisite homes available, and these same builders have garnered quite a bit of praise during past Parade of Homes. 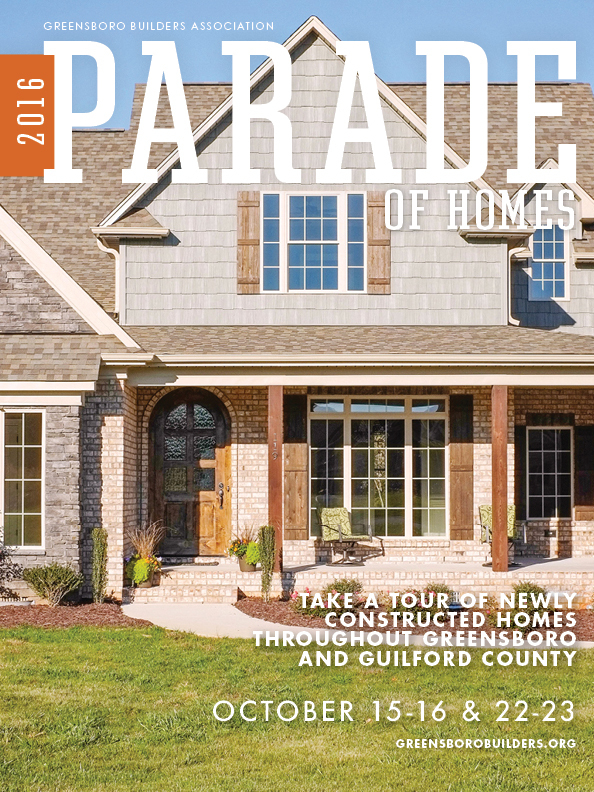 Further information about homes in both Greensboro and surrounding areas can be found in the Parade of Homes magazine located in all tour homes. Starting about a month before, magazines will also be available in many Harris Teeter and Lowe’s store. A free Spring Parade of Homes mobile app, called MyHomeFound, is also available. This app, available on iPhone, Android, and other devices, gives users access to driving directions for the tour as well as a comprehensive list of information about the homes available for viewing. For those new to the area, Greensboro is one of the largest cities in North Carolina, with a population of over 270,000. The city presents desirable living among lush trees, historical buildings, and a great climate. Greensboro is home to a large number of schools that provide quality education for its residents, as well as several respected universities, including the University of North Carolina at Greensboro and Greensboro College. The city also has great employment opportunities in various fields, making it a fantastic place to raise a family and expand or explore a career. Greensboro also offers a large number of entertainment options. Visitors and residents alike can enjoy the arts and culture side of Greensboro, the parks and gardens, and the many historic sites. Downtown is especially lively year around, and presents community events for all ages. Downtown is well known for its antique shops and galleries, specialty stores, a variety of great places to dine, and many other attractions, in addition to being a slice of urban living and a large commercial district for thriving businesses. Whether visitors are looking to buy a home at the Greensboro Parade of Homes or aim to simply admire the new homes, all are welcome. All in all, Greensboro real estate provides comfy living in a city that values a strong education, growing business, history and culture. Home values in Greensboro are expected to increase over the next year, and with the current low interest rates, now is a perfect time to buy. The Greensboro Builders Association and its sponsors, Amanzi Marble & Granite, Bill Black Chevrolet, Butler Lighting, and Stock Building Supply, have made the Greensboro Parade of Homes possible and look forward to your participation in this exciting event.